Wait, What the Heck is a Money Vision Board? Oh yeah, might be a good idea to go over what a money vision board is, wouldn’t it? In a nutshell, it’s basically a digital (or physical) poster or bulletin board you create using images and words of situations or physical objects you want to manifest into your life. The point is to think of goals you want to focus on and include in on your board. For example, I had this desire to be able to live by the beach, so I put images related to that. I also came up with words that I wanted to incorporate into emails and conversations with potential clients when negotiating contracts. 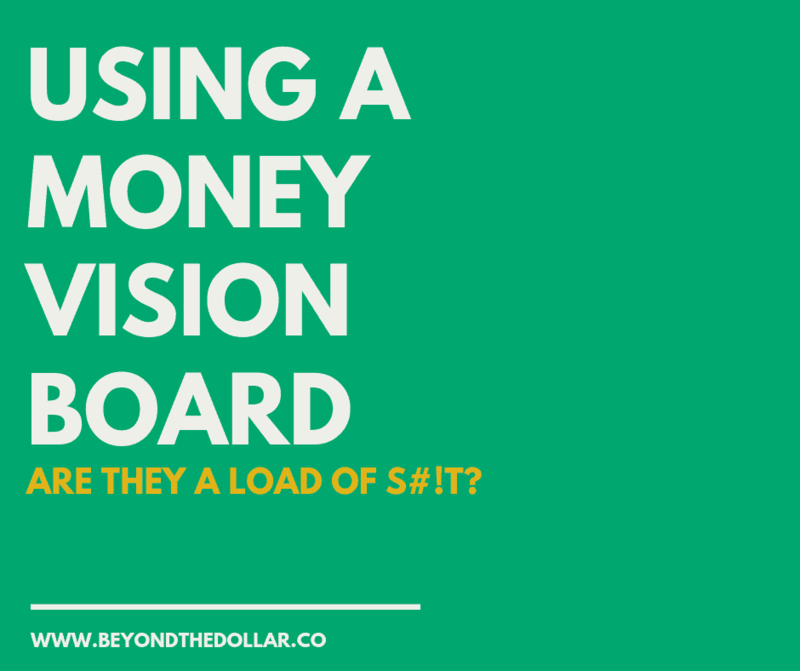 The important thing to remember is that a money vision board is a tool to help you achieve your financial goals. It’s not achieving the goal in and of itself. Creating a vision board is just the first of many steps. What many people seem to find issue with is the actual word “manifesting your goals”. There’s nothing wrong with the word, but know many people who think that it means things come out of thin air. While I am team woo-woo (can someone make a shirt that says that? ), you do need to merge some of the practical strategies alongside all that in order to master your money. It’s not enough to sit there, you need to psych yourself into taking some sort of action. To manifest something doesn’t mean creating magical solutions to your money woes. It’s surrounding yourself with intentions and encouragement so that when you do achieve your goals, it seems like your life is magical. It’s a subtle yet important difference. A money vision board is just one of many ways to do that. It’s just more fun to search for images and getting to see those objects/goals come into fruition. Creating one is pretty easy. I do find that getting into the right mindset before you start finding images is really helpful. Giving yourself space to tune into your emotions and getting clear on what a great financial life looks like does wonders. 1) Sit down in a quiet spot where you won’t be disturbed. Just stare off into space or close your eyes and breathe naturally, notice your chest rising up and down. 2) Close your eyes and drift into thoughts about goals and dreams you have. It doesn’t have to be ones within the next year or so. Just anything that comes to mind. The important thing here is to not judge any of these goals and dreams, just notice what comes up. 3) Notice any emotions that come up. Are you anxious? Excited? Scared? 4) Focus back on your breathing and open your eyes. Write down what came up for you. Once you do that, write down what your goals are. I find that it’s not enough to just think about what you goals are, and writing them down gives you time to process whether it’s something you really want. 1) Grab magazines or go on Pinterest (or any image search engine of your choice) and collect as many images as you can that relate to your goals and desires. Don’t worry if you have a lot, just collect them! If you’re collecting digital images, I find it helpful to create a separate Pinterest board to save them or on a folder on my Desktop. Get a physical folder and do the same if you’re cutting images from a magazine. 2) Do a quick check in with your emotions around your goals. How are you feeling? What excites you? What images are coming up for you? Afterwards, look though the images again. I do this weird thing where I have my hand hover over a pile of images and close my eyes so I can pick one that “feels” right. I actually let my intuition pick an image that speaks to me the most and see if there are also images that I can see myself in. If that seems way too insane to you, just look through your collection of images and see which one you like the best. If there are a few, add them in! There is literally no wrong way to do this. Your vision board can be as big or as small as you want. 3) Once you have your images picked out, it’s time to assemble! If you have images cut out, arrange them on a large board and glue them down once you like the way it looks. If you have digital images, you can print each out individually and glue them down, or use an online program to arrange it for you, then print that out. You can even make it all fancy and put it in a photo frame. I used to stick mine on some ratty cardboard, but I’m going to be all fancy and get a frame (like this one). Take a look at your final product and make sure to put it in a place where you’ll see it often. What The Heck Happens Afterwards? Like I mentioned before, creating the vision board is only the first part of this process. The idea is that you use the vision board to help you focus and visualize your goals coming true. Again it’s supposed to help you take committed action towards your goals and desires. 1) Put it in a place where you’ll see it often. I used to put mine right beside my bed so I’ll see it every morning. If you’re an eager beaver, make multiples and stick them everywhere. I have my goals as a desktop image, in my wallet (it’s stuck to my credit card) and as a bookmark. Go wild and put it where you want. 2) Journal out your thoughts and feelings about your money goals. 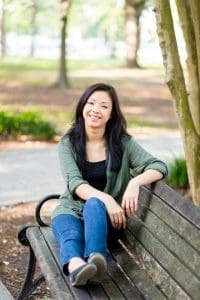 When I decided to transition out of a teaching career, I was pretty scared. Even though I had it on my vision board to work for myself, I wasn’t sure it was going to happen. So I’d journal my thoughts out as I looked at it to process my feelings towards the goal and what I could to not feel as scared. 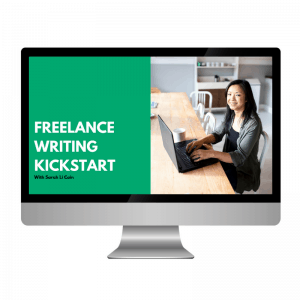 One year into self-employment later, I’m not looking back. 3) Doodle it out. I recently started doing this in the mornings and it’s such a great start to my day. It’s just another way to get yourself to look at the vision board again and just cement in your mind all the things you want to achieve. If you don’t want to doodle, just write down your goals. 4) Look at your vision board and brainstorm next steps. I always suggest to my clients and readers that you look at what your literal next steps are. For example, when I was in debt, my next step was to look for any job that would pay the bills. That’s it. Paying off the debt would happen after that. So take a look at your vision board and see what one small step you can take. Put it on your calendar planner, whatever. Once that step is complete, revisit your vision board again and figure out the next steps again. 5) Meditate with your vision board. Yup, you and your vision will be bffs after this one! Stare at your vision then close your eyes. Meditate on those goals and visualize what it would feel like to achieve them and what it would actually look like to you. One of my most recent goals is to have a small home office, so I visualize and feel myself being in the room and all the physical items I’ll have in there. 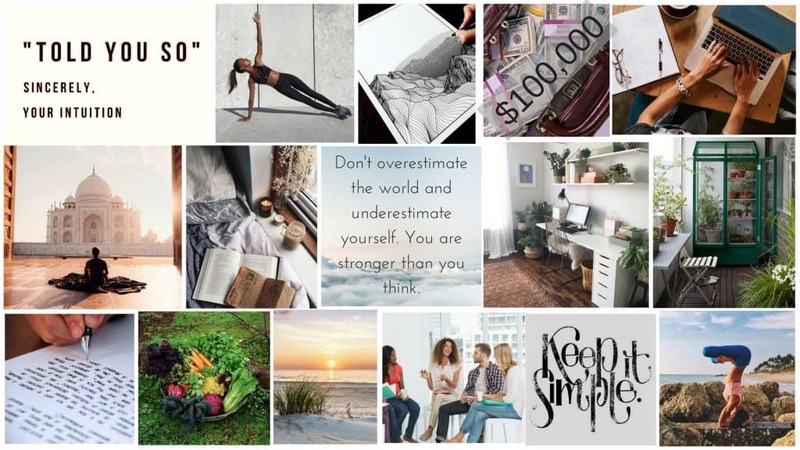 A money vision board may not be the end all be all solution to your money woes, but it can help you get excited about all the things you want to achieve in your life. If you’re intentional about it and stop thinking money will rain from the sky, then it can work.